The best art has the uncanny ability not only to give pleasure to those who view it but also to inspire a desire to respond. The best artists are a force for all art, and renowned Gullah artist Jonathan Green's work has inspired a wide range of responses from artists around the world. 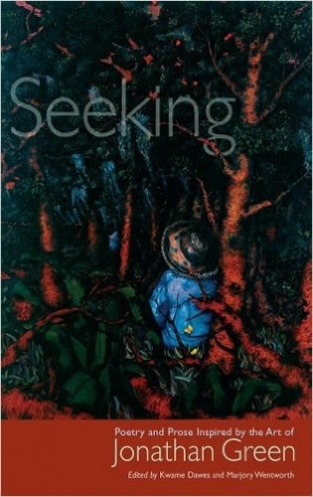 In Seeking we see how Green's art prompts works of poetry, prose, and memoir. Seeking's evocative power lies in the intimacy of this dialogue, which speaks to the shared sense of landscape and culture that Green stirs in these writers, ranging from close friends and fellow artists from his home state of South Carolina to nationally established authors who regard Green's work as an important cultural institution. Edited by Kwame Dawes and Marjory Wentworth, this collection features eleven color paintings by Green in addition to a preface on the history of the project, information on the painting. Seeking, and an artist's statement. "Art is as necessary as wine to our happiness. Each has a special place and, properly used, makes our days more gentle, our touch more loving, our loving more perfect. Jonathan Green and poems are challenge and caress; query and conclusion; that which is sought and SEEKING. We bath in and drink this water. We watch it unfurl. It is so refreshing. We exhale." " This is a tender collection marked by what inspired it, an abiding faith in the beauty of what is in the woods and the truthfulness of what the woods are."